European folklore tells of changelings. The fairies would steal a baby from its parents and place another baby in the crib. The new baby would look like the real baby, and would have the same name. But it was not the same baby. A similar thing can happen to a good business, without the knowledge of its customers. Sometimes you find a wonderful business that has a great product. Usually, it is a family business that has developed something really wonderful. It may be a business that is absolutely honest and does wonderful work. It may sell a particularly high quality food, or cooking ingredient. These businesses often would hire local people who were skilled, friendly, and competent. Often these businesses would be experts in their field, providing the very best quality and service. Can you trust that these businesses will remain as good as they were? Can you trust the good name of the business? Unfortunately, you can’t. It is an ugly fact of modern life that even the finest small business can be bought by a big corporation or soulless venture capitalists. All too often these entities are interested only in squeezing as much money out of their customers as they can. Wonderful becomes bad; competence is outsourced and lost; the best ingredients become the cheapest; and all quality is lost. Yet, the name of the business is the same; no announcement is made about the change of ownership; or the change in policy; and the customers whose trust was earned by the original business are betrayed. It has happened several times that a small dairy has produced milk of wonderful quality. The cows were raised on pasture, grazing on green, living grass, with a tranquil, peaceful life. Their milk tasted wonderful, and made you feel good. The business grew and grew, as word of its quality spread. The superb quality of milk gave the dairy a large base of loyal customers who faithfully purchased their milk. Sometime after this point, a big corporation or venture capitalists purchased the dairy. They do not notify the customers of the new ownership. They completely change the way the cows are raised and fed, so they can cut costs and make even more money. The cows are moved from pasture to confinement, and never taste green, living grass again. They are fed grains, garbage left over from making biofuels, and other products, and their milk is no longer wonderful. In fact, the milk bears no resemblance to the original product. The milk is highly processed to keep from spoiling, often by ultra-pasteurization. Yet, the carton or bottle looks exactly the same, with no indication that anything has changed. The loyal customers of the original dairy still think they are getting milk from cows raised on green, living grass in a pasture. The good reputation of the original dairy is used to sell enormous amounts of milk that is not even close to the original, wonderful product. Once, there was a company that sold only grassfed lamb. This lamb was available at some markets, and was delicious, with a nice clean taste, and great mouthfeel. I always felt good when after eating that lamb. I used to buy that lamb regularly. After a couple of years, I bought a leg of lamb from this company that looked different. The meat was a different color, and the meat felt squishy rather than firm. I cooked it in one of the usual ways. The meat left an unpleasant greasy taste in my mouth, and had a mushy texture. The flavor was different, with the unpleasant flavor that so many people associate with lamb. I felt bloated and uncomfortable after eating it. I was very surprised, because the lamb from that particular company had always been so good. I decided that the market must have made a mistake, and improperly labeled the lamb. The next time I bought some lamb, I specifically asked the butcher to make sure it was from the right company. He did, and showed me the packaging it had come from. The lamb was the same color as the bad lamb I ate the last time. The butcher told me that color could vary for all sorts of reasons. I took the lamb home, cooked it, and experienced the same greasy taste, mushy texture, unpleasant flavor, and bloated feeling. The name of the company was the same, but the lamb had changed from tasting great to tasting terrible. Once, there was a small chain of wonderful restaurants that produced some of the most delicious barbecue you could eat. The meat was cooked over real hardwood coals, and basted with a mixture that was based on a traditional Native American recipe. This mixture was so secret that only a few people knew how to make it. The meat was very high quality, always tender, and always delicious, with a wonderful natural flavor. Then, one day, the meat became tough, the flavor became mediocre, and 50 years of wonderful, quality barbecue disappeared. But the name of the restaurant remained the same. Something unique and wonderful had become boring and mediocre. What happened? A large corporation had purchased the restaurant chain and cut costs so they could make more money. The above three examples were taken from my life, and I could give you many more. The point is that you cannot expect that a business that has been good in the past will stay that way, because any business can become a changeling, even though it keeps the same name. Sometimes a business can be improved by new owners, who care about quality. These are almost always a family, or a small group of friends. These are not the new owners I am talking about. I am talking about the corporations and venture capitalists who see every business as an asset to be squeezed in order to produce the largest possible amount of profit, and could care less about quality (except for its impact on profit). The best solution I can think of is to regularly investigate a business before I use it, no matter how satisfied I have been in the past. If something appears to have changed, I will contact the business and make sure that it is still producing the same quality products that I have enjoyed in the past. When it comes to food, I will investigate if I notice any difference in taste, texture, or the way I feel after I eat it. It is truly a shame that a business that was wonderful in the past can be changed completely by a new owner, while retaining the same name. We cannot trust the name of a business to mean quality. It is better to carefully watch what it actually does, rather than rely on its name. Liverloaf made with US Wellness Meats Grassfed Braunschweiger. The standard American diet, known as “SAD” (and it is really sad, especially for those who eat it) does not contain any organ meats. In fact, organ meats are demonized for having fat and cholesterol. This is truly a shame, because organ meats from grassfed animals are one of the most nutrient-dense foods available, being packed with vitamins, minerals, amino acids, and other nutrients. Our ancestors knew the value of organ meats. They gave great value to liver, heart, and kidney, and used these foods to support the health of their own organs. We can do the same. When I did the research for Tender Grassfed Meat: Traditional Ways to Cook Healthy Meat, I read a number of old cookbooks. I was astonished to find literally hundreds of recipes for all kinds of organ meats. Liver was considered a staple of the diet, and was sautéed, made into dumplings and pastries, eaten raw, puréed, roasted, and minced. When hunters killed an animal, it was a tradition to eat the warm liver on the spot, raw, with everyone in the hunting party having a share. This was not only a tradition among European hunters, but was also done by the Native Americans, and other people all over the world. Even predators such as lions, bears, and tigers will eat the liver first. There are hundreds of traditional European sausages made from liver, liverwurst being just one of them. Pâtés are one of the tastiest results of this tradition. There were a myriad of recipes containing kidneys, heart, brains, sweetbreads (thymus gland), intestines, even lungs, spleens, and other organs. These organs were also made into sausages, pies, soups, fritters, and preparations unique to each organ. It was also traditional to stuff the stomach of an animal with chopped organ meat and other foods, the famous Scottish Haggis being an example of this. Most of these recipes were a great deal of work, because most organ meats require a great deal of trimming. There are often membranes, veins, arteries, and other inedible parts that must be removed, and the edible portions often required soaking, often multiple soakings, pounding, and intense cleaning. These recipes would often go into great detail as to how to prepare the organ meats for cooking. The healthy peoples studied by Dr. Weston A. Price all ate organ meats, and valued them highly. Their traditional preparations of these meats also involved a great deal of work in cleaning and preparing the organs. It should be noted that many of these dishes did not taste particularly good, and were resisted by children. People ate them anyway, and forced their children to eat them. Why did all of these traditional peoples go to all that work and trouble? Because they knew there was something in these organ meats that was good for them, and because this knowledge had been handed down from generation to generation. Many traditional peoples, including the Native Americans, and even the pre-drug medical profession, believed that eating the organs from a healthy animal would support the organs of the eater. A traditional way to treat a person with a weak heart was to have the person eat the heart of a healthy animal. There were a number of country doctors who reported success with using this method. Eating the brains of a healthy animal was also believed to support clear thinking. People with bladder and kidney problems would be fed kidney meat from healthy animals. 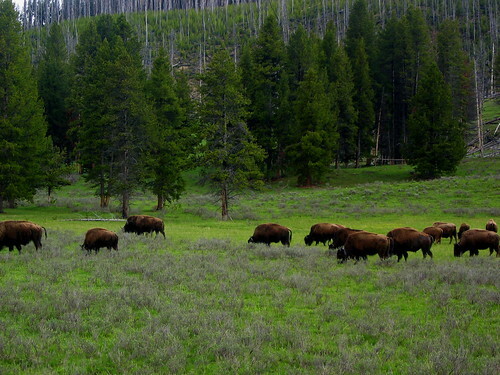 Native Americans with a vision problem or eye injury would be given the eyes of animals to eat. There are many reports confirming the success of such practices. In modern times, a number of people who need thyroid hormones have eaten the thyroids of animals, as an effective alternative to thyroid medication. However, I do not recommend that anybody do this on their own, without the supervision of a qualified medical professional. Nevertheless, many people have reported success with this practice. Liver was often given to sick people, as the huge amounts of quality nutrients in this organ helped rebuild their bodies. Great emphasis was placed on only eating the organs from healthy animals. However, most of the organ meats were eaten as part of the regular diet, by healthy people whose culture knew that eating these organs would support the natural functioning of their bodies. That is why they went through all the work necessary to prepare them. The development of the ability to identify and test for the presence of nutrients has confirmed what most people already knew—organ meats are a nutritional powerhouse, full of vitamins, minerals, amino acids, and many other substances vital for nutrition. Liver in particular is crammed full of vital nutrients, which is why predatory animals eat it first, and why it has been so valued over the course of time. Unfortunately, organ meats have been demonized because they contain fat and cholesterol, and most people are afraid to eat them. The cholesterol myth is just that, a myth, and the fat of healthy animals is beneficial for human health, as shown in these articles: Know Your Fats Introduction and Cholesterol: Friend or Foe? The organ meats eaten by our ancestors and traditional peoples have great nutritional value. We can get the benefits of organ meats, even today. I do not recommend eating the organs of factory animals. The organ meat of factory animals is not the same meat that has been eaten for thousands of years, but is different, as the animals have usually been given hormones and antibiotics, and have not been fed their natural feed. My personal choice is to eat the organs of grassfed and grass finished animals only. In the case of omnivorous animals such as pigs and chickens, I choose to only eat the organs of pastured animals. But I will confess that all the preparatory work that is necessary for enjoying most organ meats is more than I want to do. I will buy organ meats that come ready to cook, but my favorite way to eat organs is by eating organ sausages. Great care must be taken in choosing sausage, because all kinds of undesirable ingredients are often added to them. I insist on knowing everything that is in a sausage before I eat it. Currently, I know of only one Internet source for grassfed organ sausage that has no undesirable ingredients. These sausages are of the highest quality, and I eat them at least once a week. These are the organ sausages made and sold by US Wellness Meats. They make a delicious liverwurst that contains liver, heart, and kidney. They make two kinds of braunschweiger that contain a lot of liver: one cooked, and the other one raw. They also sell a headcheese that contains tongue and heart. These sausages can be made into delicious recipes. 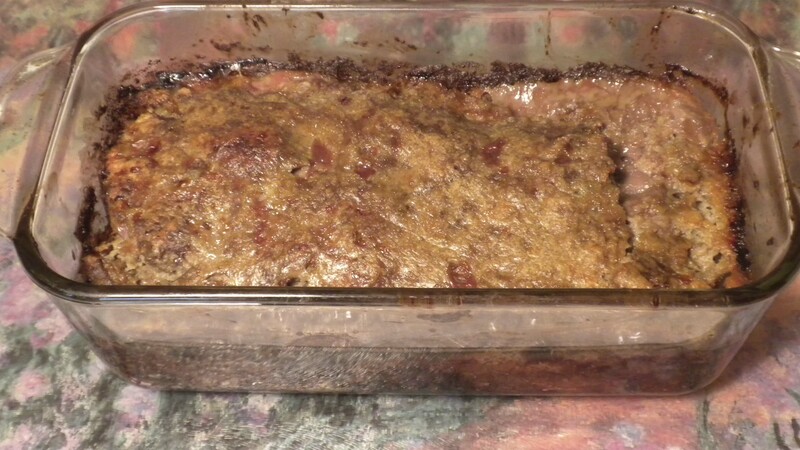 Here is a link to a recipe I created for the raw braunschweiger: liverloaf. There are also recipes using these sausages on pages 179-182 of Tender Grassfed Meat. Organ meats are some of the most vital and nutrient-dense foods available to us. Our ancestors knew this, and we can learn from them. I am doing something I have never done before. I am recommending an online cooking course. Why? Because it is not enough to know WHAT to eat. It is just as important to know HOW to cook it. If you are going to eat real food, you will have to learn how to cook it, because you can’t get it in a package, or a fast food joint, or 99% of restaurants. The only practical way to get real food is from a skilled home cook, and that cook might as well be you. Less than a third of the people in the United States know how to cook anything from scratch, and very few of those people know how to cook grassfed meat, wild seafood, and grassfed organ meats. This course is a rare and wonderful chance to learn a lot of the basics of how to cook grassfed meat, wild seafood, and grassfed organ meats, knowledge that everybody should have. The course is entitled Surf & Turf, and is being given by Ann Marie Michaels of the Cheeseslave blog. Here is a link that provides a description of the course and place to sign up: Surf & Turf. I am not an affiliate of this program, and I will not get a penny from the fees you pay for the course. Ann Marie Michaels is better known as Cheeseslave, and has been blogging about real food for some time now. Like me, she is a devoted follower of the teachings of Dr. Weston A. Price, and cooks and eats according to those principles. She is a meticulous researcher. She does not just advocate the benefits of real food, she eats it. And she knows a lot about cooking it. The many delicious recipes on her website are clear, well organized, and they work. Her recipes are faithful to the nutritional principles taught by Dr. Price, and provide wonderful nutrition. She cooks from scratch several times a day for her family, almost every day. I have communicated with Ann Marie a number of times, by telephone and email, and I have learned a lot from her. In addition to her own vast experience and knowledge, Ann Marie has consulted with a number of experts in developing Surf & Turf. The class will include podcasts with some of these experts, including a podcast with me covering the cooking of grassfed meat. The course concentrates on how to cook grassfed meat, poultry, and wild seafood. It has a definite low-carb emphasis and is faithful to the teachings of Dr. Price. Covers the need for high quality protein, health benefits of proteins and fats, why grassfed is better, and the need for healthy fats. Covers smart shopping for quality meat and seafood, the health benefits of grassfed meat and wild fish, the equipment you will need for the course, and how to really make the purchase of grassfed meat affordable. Covers safe and healthy grilling of grassfed meat and wild fish, with information on grilling equipment, fuel, and a number of video and printable recipes, including better grilling methods. Covers the preparation of raw seafood, the health benefits of raw seafood, and safety issues. Raw seafood was one of the most valued foods of the healthy peoples studied by Dr. Price, and is full of vital nutrients. A number of video and printable recipes are included. Covers the cooking of wild seafood, also valued by the healthy peoples studied by Dr. Price, including video and printable recipes. Covers the making of real bone broth, one of the basic foods of the healthy peoples studied by Dr. Price. I really like the emphasis on using filtered water, and why only filtered water should be used. More recipes are provided. Covers the cooking of healthy soups and stews, using grassfed meat and wild seafood. Even more recipes, video and printable. Covers the roasting and braising of grassfed meat and poultry, with attention given to making delicious meals out of economy cuts. Will include a podcast with me on cooking grassfed meat. More recipes, both video and printable. Covers pan frying and deep frying with the healthy fats used by our ancestors, including grassfed beef tallow. You guessed it, even more delicious video and printable recipes. Covers the making of healthy salads and sandwiches, with a number of recipes. Covers the health benefits of organ meats, and many methods of making them palatable, even delicious. All the healthy peoples studied by Dr. Price valued organ meats. Modern science has confirmed that organ meats are one of the most nutrient-dense foods available, and this lesson provides badly needed knowledge of how to prepare and cook them. More recipes, both video and printable. Even more recipes for healthy organ meats, with an emphasis on wonderful, nutrient-dense pâtés. Covers the making of healthy snacks, side dishes, and appetizers, with recipes. Registration for the class ends on August 14, so it would be best to check it out in the immediate future. Surf & Turf is one of the few good resources available for learning how to cook grassfed meat, wild seafood, and other nutrient-dense food that nourished the healthy peoples discovered by Dr. Price. I highly recommend it. I should disclose that while I am not an affiliate and will not receive any share of the money paid by anybody for the class, the podcast I appear in will be publicity for my book that could result in sales, which would result in my receiving some financial compensation. Don’t Trim the Fat—It’s the Best Part! 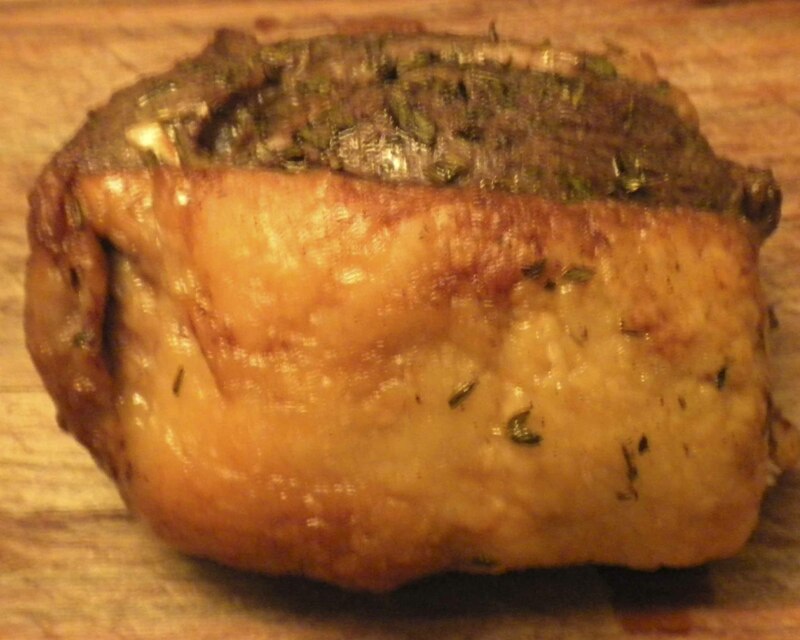 This beautiful fat cap helps make a wonderful herb roast. The half chicken arrived on my friend’s plate, with a wonderful aroma. It was grilled over hickory to browned perfection, the crisp skin redolent with a wonderful spice rub that promised taste heaven. My friend picked up his knife and fork, carefully removed every trace of the magnificent chicken skin—and discarded it. 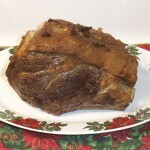 The prime rib roast looked great on the website photo. The meat was a beautiful cherry red color, crowned by a thick cap of gleaming fat that promised great taste and nutrition. I ordered this magnificent roast, anticipating how wonderful it would look and taste. The roast arrived. Every bit of the magnificent fat cap promised by the photo on the website had been trimmed off. I ordered a cut-to-order bison Porterhouse for a very important occasion. I made sure to instruct the seller to leave a thick coating of the bison fat on the meat, as bison fat gives incredible flavor. The steak arrived. It was a magnificent piece of meat—except that almost all the fat was trimmed off. Each of these events point out one of the most insane aspects to our society. We have been trained to discard and throw out one of the most nutritious substances known to humankind—saturated fat from grassfed animals. Saturated fat from grassfed animals should not be trimmed off and discarded. It should be used in cooking and eaten, just as humankind has been doing for hundreds of thousands of years. Why does almost everybody fear saturated animal fat? The answer is simple—marketing. The sellers of artificial fats and artificial oils would have no market if people continued to use saturated animal fats that have nourished humankind for eons. The only way to get people to give up these tasty and wonderful foods would be to either come up with something better, or make people afraid to use them. They could not come up with any artificial food that was better or even close to being as good as those developed by nature. This left fear. Adolph Hitler said that if you repeated a lie often enough, and loudly enough, and repeated it with enough fervor, people would come to believe it. It would be hard to find any concept that has been repeated as much, or stated so loudly, or advocated with such fervor as the “saturated fat is bad” untruth. The truth is that saturated animal fat from naturally fed animals is one of the most beneficial nutrients know. See the following article for more information: Know Your Fats Introduction. A good description of how America was misled is contained in the article The Oiling of America. Your brain is made of fat. So is mine. So is everybody’s. The right kind of fat is crucial to the proper functioning of the brain. A deficiency in fat can lead to mental and physical problems. The right kind of fat is—saturated animal fat. This fat, especially the fat from grassfed animals, contains a huge amount of vital nutrients. Animal fat, including the fat found in organ meats, is the only source of real Vitamin A. (Plants have beta carotene, which is not Vitamin A, but a precursor that a healthy body can use to make vitamin A.) Animal fat is by far the best source of essential fatty acids, which are crucial for nutritional support of the brain and many body functions. Animal fat contains substances that effect digestion, blood sugar, regulate the body’s production of hormones, enable the various parts of the brain to communicate effectively with each other, regulate the weight and metabolism of the body, and provide high-quality energy fuel that our bodies have been using for hundreds of thousands of years. Our bodies and brains are unbelievably complex organisms that are able to deal with almost any physical or mental challenge that is likely to arrive—if they have the nutritional fuel needed to function properly. This fuel includes saturated animal fats. A more detailed examination of the benefits of saturated animal fat can be found in this fine article: The Skinny on Fats. Dr. Weston A. Price spent ten years studying the diets of traditional peoples. The healthy peoples he studied were free of the chronic diseases that ravage our “civilized” world—such as cancer, heart disease, allergies, infertility, asthma, birth defects, etc—as long as they ate their traditional diet. These traditional diets contained far more nutrients than ours. While there was a lot of variety in these diets, all of them included a huge amount of saturated animal and/or fish fat. This fat, from animals eating their natural diet, has been perhaps the most valued food in the history of humankind. People, from ancient Rome to 19th century Russia, used to write poems celebrating the blessings of animal fats. When animals were sacrificed to the pagan gods, the most valued part of the animal—the fat—was offered. Many peoples had a tradition of having a lot of food after a funeral. Whether it was the Jewish custom of sitting Shiva, or the Irish custom of having a wake, or any of the others, foods high in animal fat were always served. These traditional people knew that these foods would calm the mind and help people deal with their grief. “Living off the fat of the land” was a famous saying that meant living the good life. Modern science has discovered many of the benefits of this most valued food: Some Recent Studies on Fats. Meat roasted with a covering of its own natural fat is far more tender and delicious. The fat bastes and cooks into the meat during the roasting process, keeping it tender, and adding superb flavor. Pot roasts and stews also have their flavor and gravies enhanced by this wonderful fat. Sausages and ground meat are much better, both in taste and nutrition, when they contain a healthy portion of life-giving animal fat. 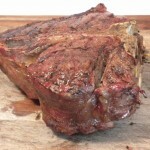 Steaks cooked with a rim of their own natural fat are more tender and have superb flavor. In fact, it is commonly accepted in cooking circles that most of the flavor of meat is in the fat. Traditional peoples cooked with animal fat, with natural pork lard being the most widely used and popular cooking fat in human history. Lamb fat, beef tallow, bison fat, chicken fat, in fact, fat from every kind of meat animal, were also widely used. I personally use saturated animal fat for cooking grassfed meats. Whether it is beef tallow, or butter, or natural lard, or duck fat, all of them are perfect for frying, basting and sautéing. But nothing can do more for the flavor and tenderness of cooking meat than its own natural coating of flavorful fat. So I have a favor to ask from meat sellers, butchers, ranchers, and retailers – don’t trim all the fat off. Leave at least one quarter inch on the meat. Just one quarter inch. That’s all I ask.